Located in an area inviting to take a rest a few steps away from the harbor, this wonderful brand new and furnished flat covering 80m² includes an entrance hall, a spacious living room, a balcony with views of the Guadiana River and Portugal, an independent kitchen fully equipped, a bathroom and 2 bedrooms that can host 6 people. Animals are welcome. 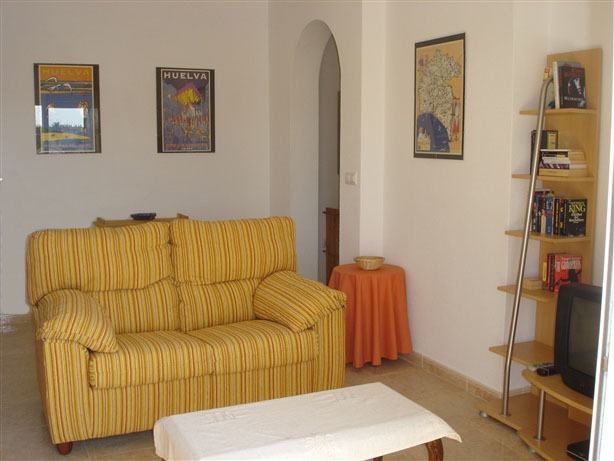 Its exceptional position 3min away on foot from the Municipal Zoo and at only 5min on foot from the heart of the town makes it the perfect lodging for families with children, as well as for those who want to relax and enjoy the beach, golf and the town . In its immediate vicinity is all the convenience that one can require: coffee-bars, restaurants, supermarkets, newspaper stall, hairdresser, garage mechanic, medical centre, veterinary and sport centre. Situated at the Guadiana River’s bank, border with Portugal, Ayamonte has always been a quiet village of fishermen that extends its white houses sloping down to the harbor. The Greeks baptized it with the name of Anapotaman (“over the river”), where its actual name comes from. At the town’s high, built over the ruins of a Roman castle, stands the Parador de Turismo, Government’s luxury hotel chain, from which there is a magnificent panoramic view from the town and the Guadiana River’s mouth. Between the interesting buildings to visit stand out the Our Lady of Las Angustias and San Francisco churches, both from the XVI century; the parish church of El Salvador, from the XV century; and the “Indians” houses, name given to the Spanish emigrates after their return from America. At only 4 kilometers are the beaches of Isla Canela and Punta del Moral, populated especially in summer. 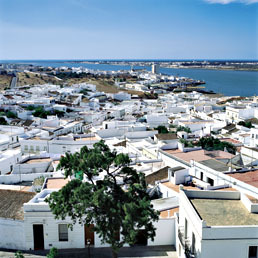 Its exceptional climate offers us some 315 sunny days per year, with a temperature from 15° in winter and 35° in summer softened with the fresh breeze from the sea, which makes Ayamonte the perfect spot to be on holiday and enjoy its 3 golf courses, without forgetting the other 14 within a radius of 40km between Spain and Portugal!